cafes, pubs, and retail shops. The event is free to the public, rain or shine, noon to 6pm each day. My buddy Fish McGill and the Lincoln Arts Project of Waltham present: A collection of Bostonia Collectives. I will have a couple of pieces in this show as part of Project SF. I also had a hand in a large-scale silk screen collaboration with Anti Designs. This show is going to be a blast. 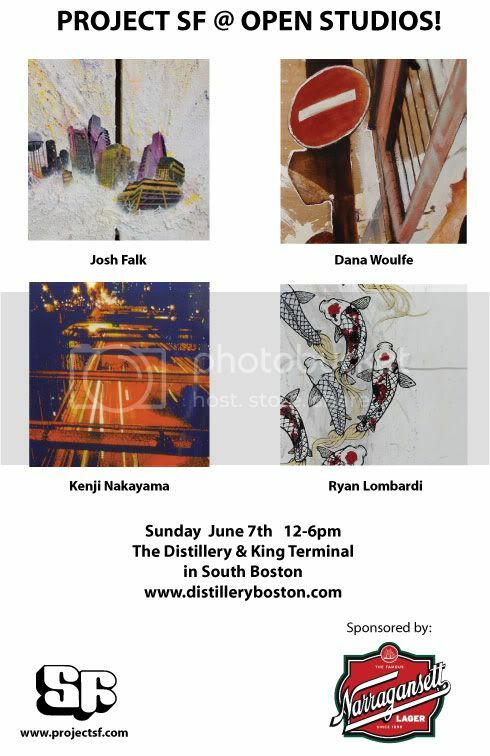 I am psyched to be able to show my work with some of Boston's best. 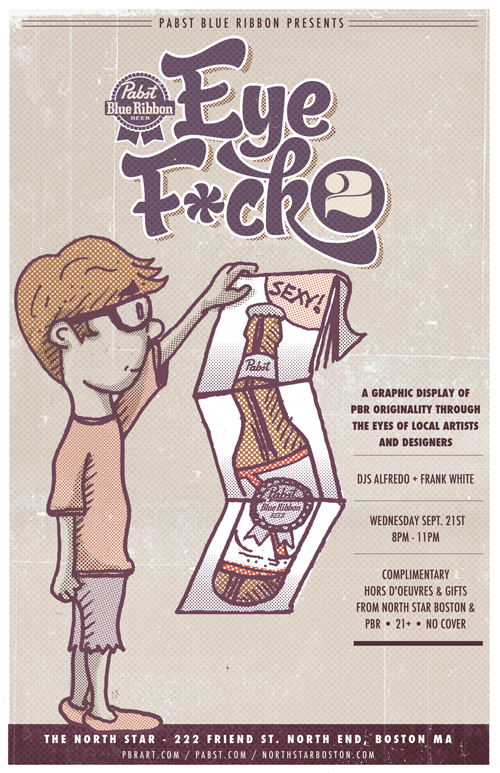 Make sure you stop by for some Eye F*cking! My homie Dana Woulfe and I were mentioned on CBS in an amazing write-up featuring Voltage Coffee & Art. The confines of the artist’s studio allow the artist to focus, free of distractions, on the creative process. Both a place of solitude and freedom, the studio is where ideas come to fruition and the sometimes messy practices of art making are of little concern in regards to the space. The studio, however, with all of its usefulness, can also be limiting. In an attempt to address the notion of isolation within one’s studio, The Distillery Gallery has challenged a group of artists to produce works beyond their normal individual control. “Make it Together” asks artists to collaborate with one or more fellow artists on individual pieces, thus surrendering complete authority by any one contributor. The results will be unique to each pairing and will encourage the participants to take risks they otherwise do not take in their routine individual processes. Hilary Alder, Gulay Apley, Aimee Belanger, Walter Crump, Alison Davis, Pat Falco, Josh Falk, Elizabeth Grammaticas, Stephen Holding, Vanessa Irzyk, Meredith Iszlai, AD Jacobson, KDONZ, Cassandra Long, Eric Love, Kenji Nakayama, Elizabeth Nicholson, Adam O’Day, Shana Paleologos, Danielle Spurge, Joshua Taylor, Nick Ward, and Dana Woulfe. Please join us for the opening reception on Thursday, August 25, from 7-9pm. I have a very very very small piece in the Chain Letter exhibition at the Shoshana Wayne Gallery in Santa Monica. The show was curated by Doug Harvey & Christian Cummings. I recently had to the pleasure of painting Sugar Daddy's Smoke Shop, with fellow Project SF crew-mates: Dana Woulfe, Ryan Lombardi, and Kenji Nakayama. You can check photos of the project Here. Voltage Coffee & Art host Violent Nature. Featuring works by Dana Woulfe and Josh Falk. Show will be up through August 20th. Click here to see photos of a recent commission MrNvr and I painted for the New England Revolution. 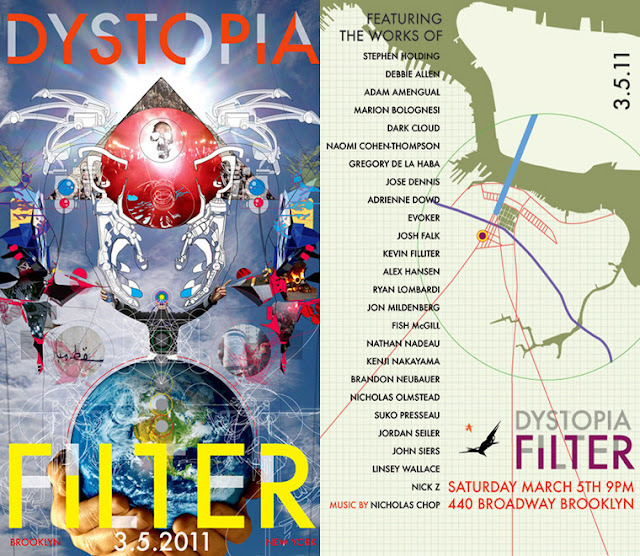 SECTION 440 in Brooklyn, New York is pleased to announce the opening of DYSTOPIA FILTER ; a multimedia exhibition curated by Brooklyn-based artist and designer Stephen Holding. Featuring the works from over 20 different artists from the United States and abroad, the second installment of DYSTOPIA FILTER functions as a cross-section of contemporary art and design, fusing elements of sculpture, painting, photography, installation and music into an immersive environment of shifting sound, form and color. The collective works of this exhibition narrate the cyclical process of filtering out elements from our environment and re-contextualizing them through our own collective vision. These works then live on and redefine our surroundings, setting the stage for the process to begin again. It is through this constantly overlapping process that we change each other, our environments, and ourselves. 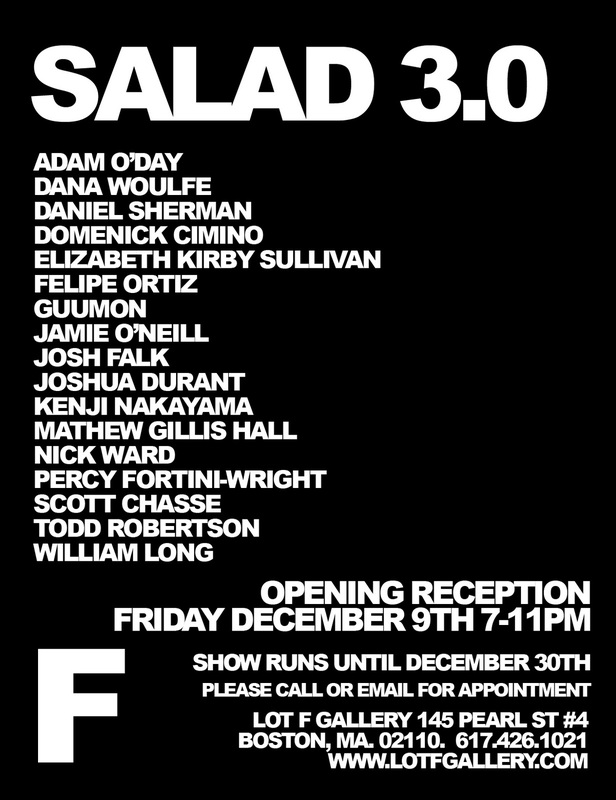 Stephen Holding, Debbie Allen, Adam Amengual, Marion Bolognesi, Dark Cloud, Naomi Cohen-Thompson, Gregory De La Haba, Jose Dennis, Addie Dowd, Evoker, Josh Falk, Kevin Filliter, Alex Hansen, Ryan Lombardi ( Enamel Kingdom ), Jon Mildenberg, Fish McGill, Nathan Nadeau, Brandon Neubauer, Kenji Nakayama, Nicholas Olmstead, Suko Presseau, Jordan Seiler, John Siers, Linsey Wallace, and Nick Z. Music by Nicholas Chop. SECTION 440 is a 1500 square foot living, working, and exhibition space located in Southside Willimasburg, Brooklyn. This space is dedicated to creating and showcasing both local and non-local artists of all disciplines in an ongoing series of collaborative exhibitions. If you are interested in getting involved with our future events, or for further information regarding DYSTOPIA FILTER or any of the artists involved, please email Stephen Holding at airmail@metalwing.com. Limited edition of 20 Josh Falk x AntiDesigns "Inertia" prints available now! 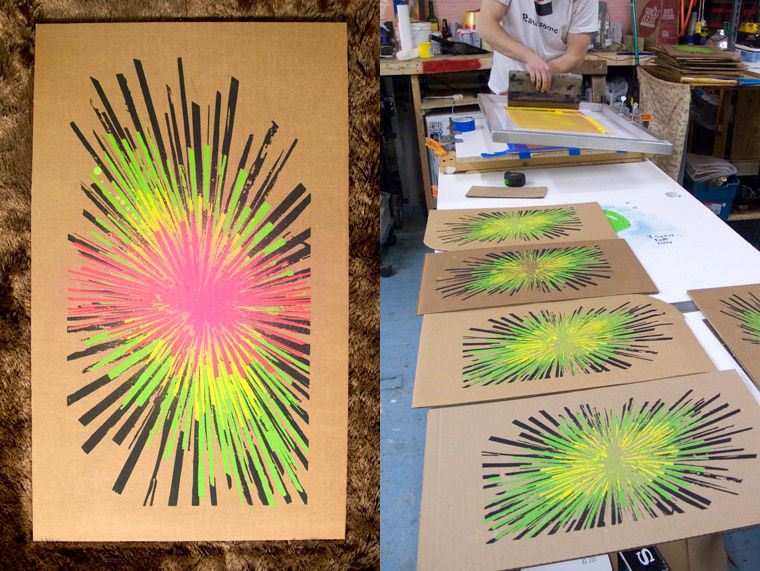 Each print is one of a kind, hand-screened, and spray painted on found cardboard. 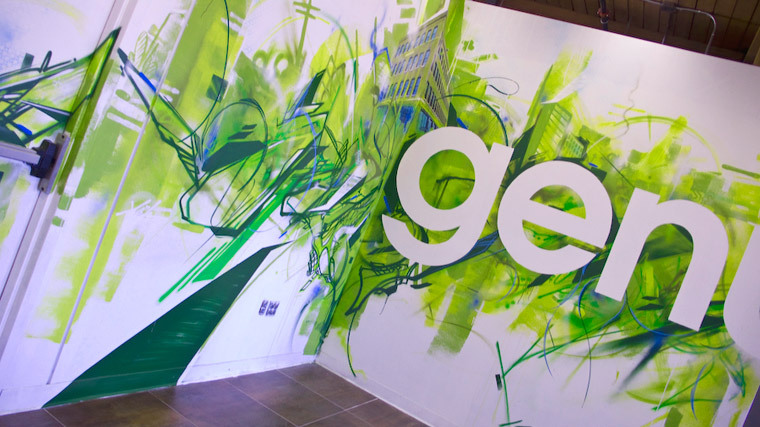 Here are some photos from a recent commission for Genuine Interactive, that myself, Dana Woulfe, Steve Holding, and Kenji Nakayama, created and installed. 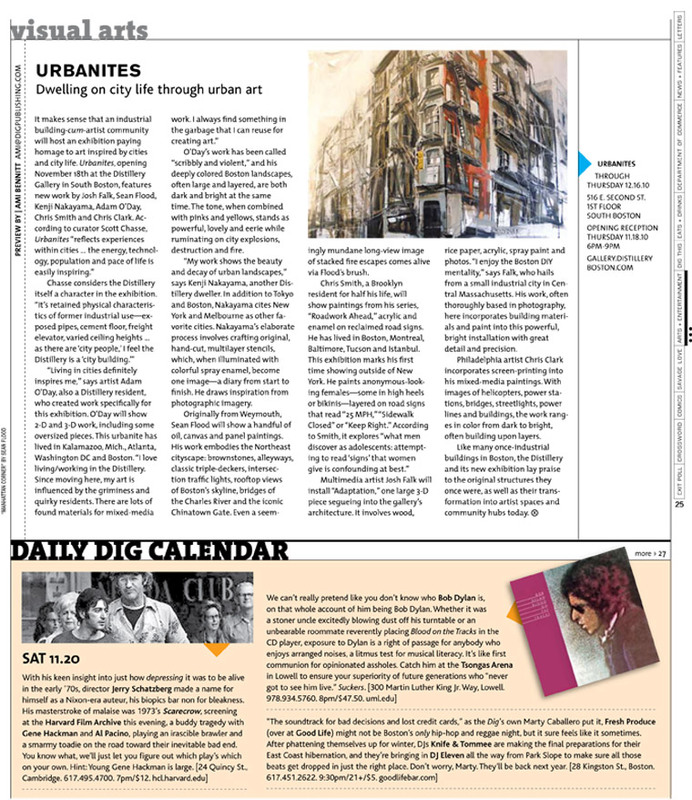 Check out the Weekly Dig article on Urbanites. Also follow the link to see a preview of the show. 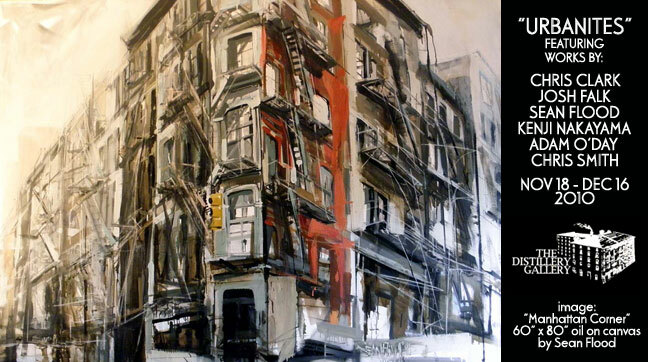 I will have a new piece installed at the Distillery Gallery for Urbanites. 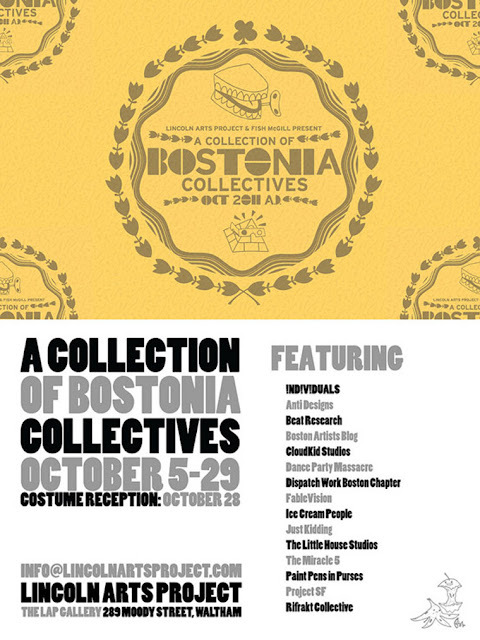 A group exhibition featuring some of Boston's best. The reception will be held from 6-9pm on Thursday, November 18th. 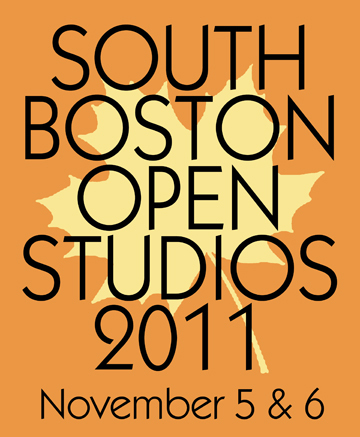 I will be participating in the Fall edition of South Boston Open Studios. Please stop by and see what I have been creating. 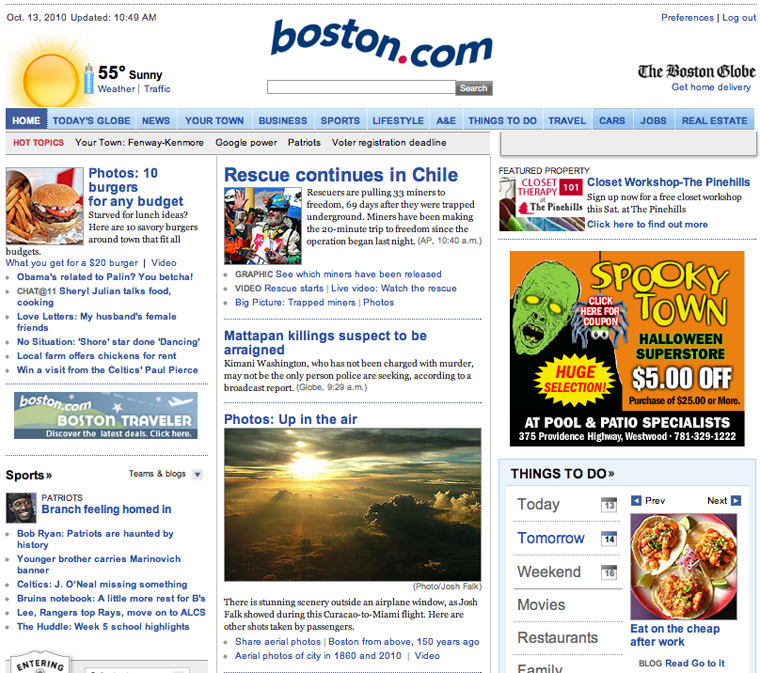 I randomly had a photo that I shot in 2005 on the cover of Boston.com. Josh Falk mention in this weeks issue of the Weekly Dig for Turning Art. 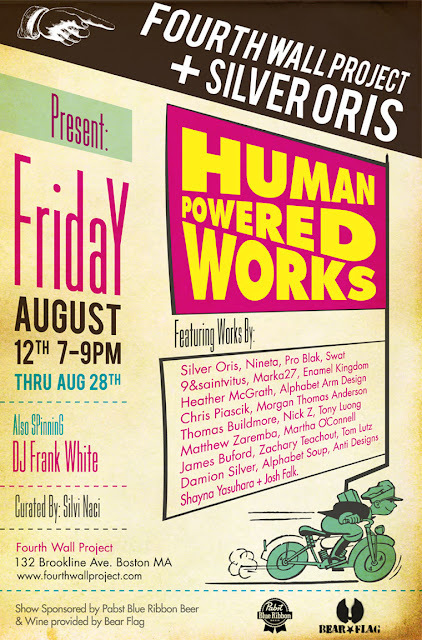 Myself and the rest of Project SF will have some old, and some new work on display at Orchard this month. 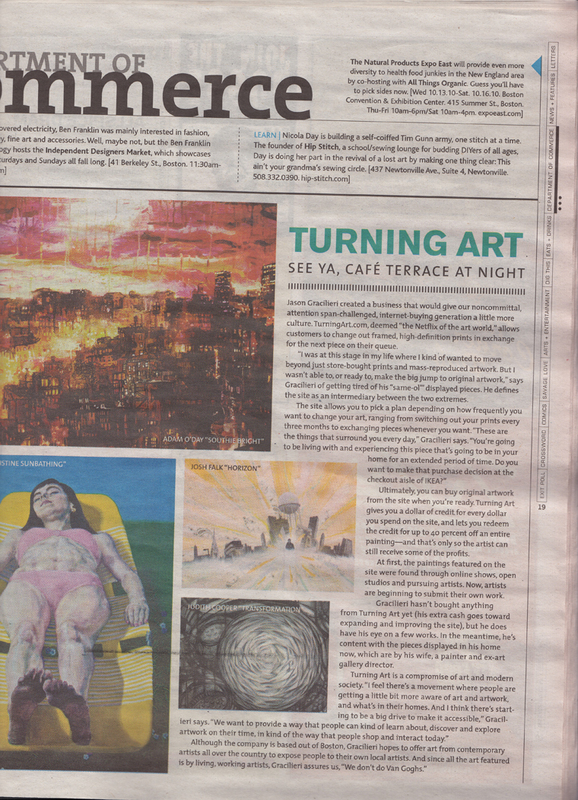 I got some good press for a new project that I am involved with called Turning Art. You can check out the articles here: Boston Herald, and The Cambridge Day. Carrboro, NC (August 23, 2010) - Wootini Gallery is excited to announce the opening of the Wootini Gallery Roadshow, a group exhibition of work from artists from the Wootini Art Tour, curated by Jess Wootini (aka "Team Sweet"). For two weeks this summer, Jess hit the road, traveling to Raleigh, NC; Philadelphia, NYC; Boston, MA; Chicago. IL; and Las Vegas, NV meeting artists along the way, interviewing them, snapping photos and collecting art to bring back to Carrboro. Because the participating artists range in backgrounds from street artist to photographer, the final art show will be an engaging, fun exhibition with a diverse body of artwork. The Roadshow will feature everything from mixed media work to handmade plush figures. As an added bonus to all of those who come to the opening reception, Boston-based artist, Evoker will be in attendance, doing some live painting around the gallery. Evoker is one of three Roadshow artists in Project SF, an impressive international art collective that produces innovative artwork seen around the world. The opening of the Wootini Gallery Roadshow also marks the grand opening of Wootini's new gallery and storefront location at 101 Lloyd St, a building that currently houses The Merch and MiniCassette Tees, and at one time was the Carrboro Jail. If you would like more information on the Wootini Gallery Roadshow Exhibition or Wootini itself then please contact Jess George on 561 789 8253 or jess@wootini.com. Check out these photos of the recent mural Project SF painted at Bodega. I recently shot photos of Dance Party Massacre's latest apparel lineup. Check out my latest photo project CANDY COATED HOUSES. I had the pleasure in painting the Distillery Gallery for the 2nd Edition of Paint it Now. Opening March 4th 6-8pm. Home Boys. New works by Josh Falk and Nick Z. McCormack and Scanlan. 68 South Street, Jamaica Plain. This weekend I will be live painting at Mount Snow for the finale of the Winter Dew Tour. I will have work on display at the Washington Street Art Center this week for a group show entitled Hey I Know That Guy. Curated by the Snow Project. 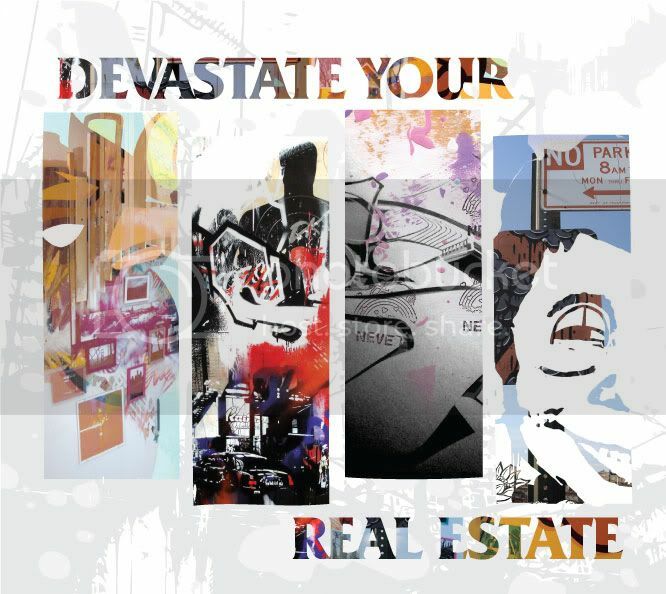 I am part a of a group exhibition called Devastate Your Real Estate, which will be open through October 18th at Boston's Fourh Wall Project. 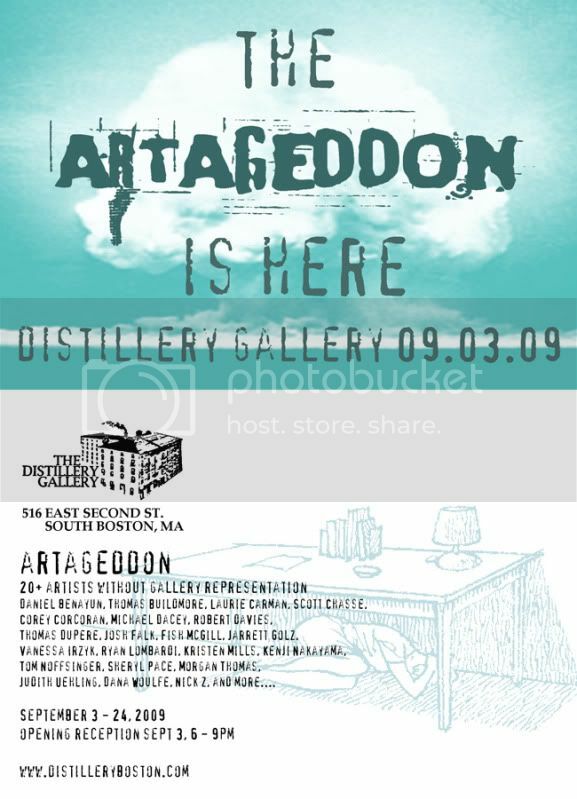 I will have work hanging at the Distillery Gallery for Artageddon a group show featuring some of Boston's finest. This past weekend I had the opportunity to paint 2 of the skatepark features for the Boston edition of the Dew Underground Summer Tour. This was an internationally televised event. Aired on NBC, MTV2, and Fuel TV. You can also check out more photos of the project here. The Boston edition of Sneaker Pimps will once again include a live art installation by Project SF. I recently hung work at the Westside Lounge in Cambridge, MA. The Show will hang until mid August. The recent Lilian Asterfield photo shoot gone public on MTV Switch Blog. This Sunday, June 7th I will be opening my studio doors with the Project SF, So Fresh!!! 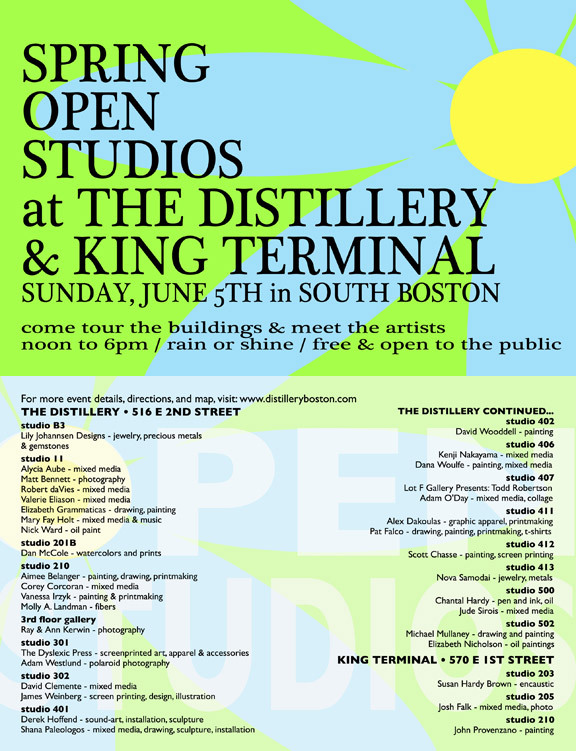 Fam, from 12 - 6pm for the King Terminal, and The Distillery open studios. 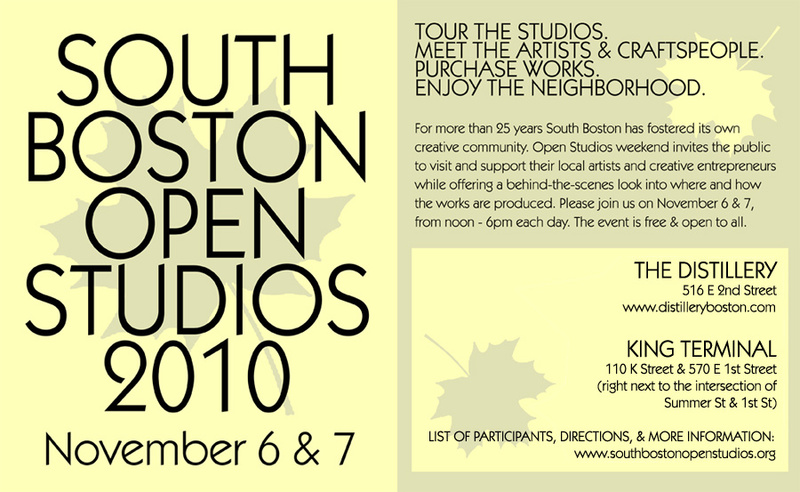 Location: 570 East 1st Street, South Boston, Ma. Enter through Elkins, off Summer Street. If you can't make it to Portland, ME to see "Behind Brown Eyes" at Coduroy...you can check out the show here at OUI. 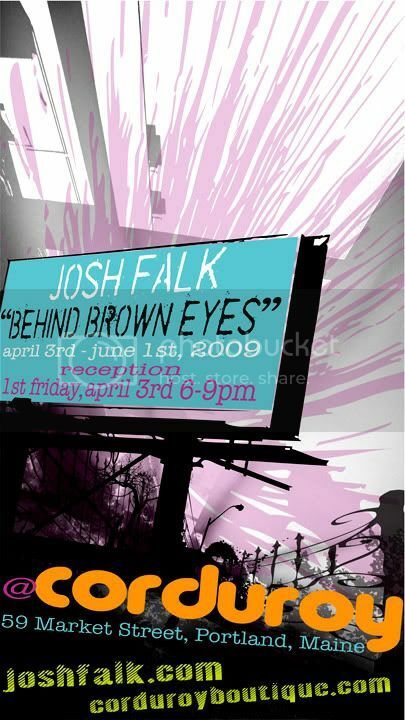 Josh Falk presents: "Behind Brown Eyes". A solo exhibition of my most recent works, opens April 3rd at Corduroy in Portland, ME. Josh Falk prints now available on Etsy. New Josh Falk and Anitdesign tee collaboration available here and here. I currently have some prints on display and for sale at Corduroy Surf Boutique in Portland, Maine. 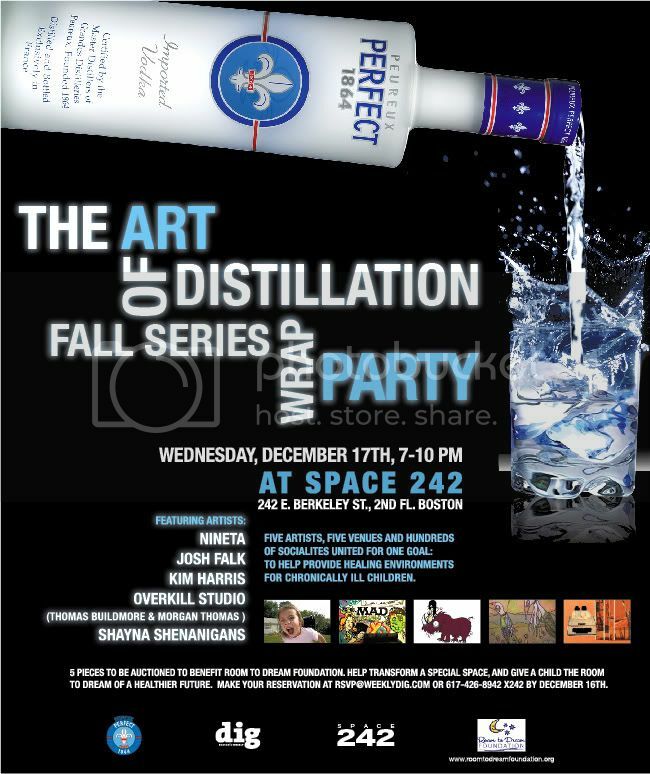 Next Wednesday the 17th, I will have some work for sale at Space 242, including a canvas that I recently painted live at MKT. The proceeds generated by the sale of this canvas will benenfit the Room to Dream Foundation. To attend please click HERE and follow the directions. I recently customized a can of spray paint that will be featured in 400ml. 400ml is an art book that will showcase 400 artists from around the world. The can will be exhibited throughout Europe in efforts to raise money for Le MUR, an organization driven to help urban artists. 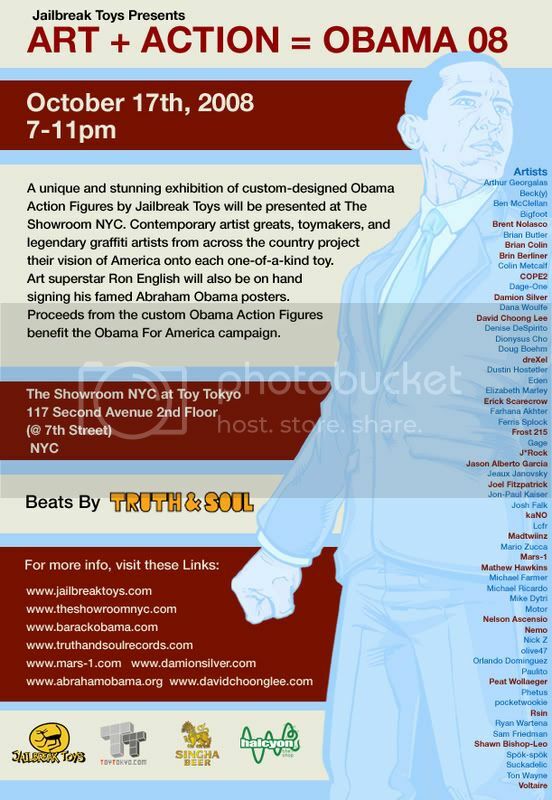 Also if you're in the NYC area please check out my custom painted OBAMA toy for Art and Action in part with Jail Break Toys. The toy will be displayed at The Showroom NYC on 17th of October, from 7 - 11pm. I just launched a new website/blog called Focus. This site was designed to show you some of the various projects that I am currently working on. Please check back periodically to view the updates. Paint It Now opens tomorrow night at the Distillery Gallery. 7pm... I was able to jump on board last minute, and be a part of this massive collaborative painting. If you can't make the opening the wall be evolving over the course of the next month or so. Be sure to see it. For the month of August I will have a collection of photos on view with Jeff Allen at The Otherside Cafe, Boston. The opening will be held on Wednesday the 6th of August...starts at 9pm. Come out and have a beer. I recently sent over a few posters to Budapest, Hungary for Millenaris Street Games. My posters will be part of a larger installation that will unfold during the event. You can check out my poster here. I have a couple of photos featured in the most recent issue of Clouded Thoughts. It's an up-and-coming street art and culture mag based out of Australia. If you happen to be in Australia...pick up a copy! Keep and eye out for Git Dat Munny. A vinyl toy battle brought to you by Mayan Tamang that is showcasing a gangload of local and international artists...including myself. I will have a piece at the Othereside Cafe for a charity fundraiser sponsored by SMAACK. Student Musicians Against Aids at Berklee College of Music. Check It! I donated 2 pieces to The Artists For Humanity for their 3rd annual Greatest Party On Earth. This fundraising event will be held at their platinum level green building, known as the Epicenter. Few things...I have made some updates to the "flicks" and "other work" sections of this site. Also if you will be out in the Long Beach area in early March, check out Visually Remastered. Josh Falk on Superheroes in the Miami Herald. Check out the t-design I did for the Thred Bull-Drink Art design contest. I have some limited edition prints available at LAB. On Novemeber 15th a panel I made for Rock and Art will be auctioned off at the Boston Opera House. Be sure to checkout the latest additon of the Project SF Family here. Couple of things to mention. On Saturday the 27th of October I will be part of The Vinyl Massacre at LAB. Also come through The Estate on the November 15th to check out a custom skateboard graphic I did for the Boston edtion of Hit the Deck. On Thursday the 18th, I will have some photos on display at the Rhys Gallery. These photos will document Nick Rodrigues's complete body of work. You can check out the web-flier HERE. Godon Riker" @ Bodega on the 7th, from 6-8pm. I had a hand in the painting of a 14ft portrait of Gordon Riker. Please come by to view Gordon's final works, and the debut of Gordon's t-shirt line "Art Terror". Recent updates have been made to the O.U.I. section of my website. Check it out. Saturday the 11th, I will have some work hanging up at Lola Lounge in Montreal, Canada. Along with a slideshow/retrospect of Project SF. If you are in the area of the Bank of America Pavilion in Boston, check out "Bozton". It's the second painting I did for Boz Scaggs in part with Rock and Art. You can check out my recent trip to the San Franscico Bay area here. Yes folks...It's true! The long-awaited JoshFalk.com has finally hit the web. I thank you in advance for taking the time to browse through my site. I would also like to inform you that the site is still undergoing some construction. You will see some subtle changes within the next couple of weeks. Including the addition of the O.U.I. (photo blog) page...and some minor aesthetics.